Sage Prevalon Boot Heel Protector from HealthyKin.com completely floats the heel, delivering total, continuous pressure relief. 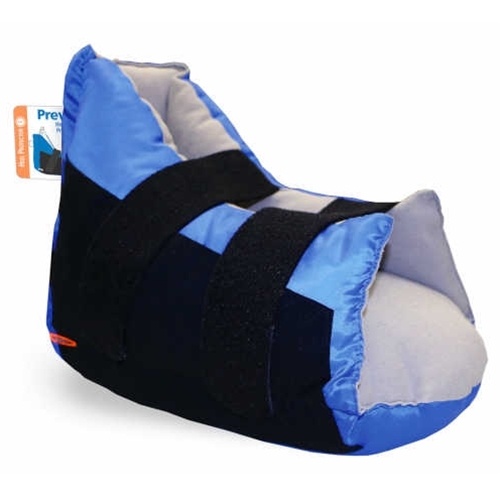 This helps to avoid the high human and financial costs associated with heel pressure ulcers. When used with an effective prevention protocol, Prevalon provides the most advanced and clinically proven heel protection, and falls in line with professional guidelines and recommendations for heel ulcer prevention and treatment. This boot was suggested by our wound doctor as the "best" boot out there for heel sores.....They are soft and lightweight, but too bad they are so bulky...but they do the job they are meant to do...Fast delivery was so appreciated. Excellent product and great price. Suggested by wound doc and local medical supply company sold it for $500 per boot & same price on Amazon. Found this site also on Amazon for $100 at Healthykin.com and it's the same boot. Superior service! This was very easy and delivered quickly, I also saved $40 dollars from the manufacturer price. I'm glad I chose this site over amazon. Very fast service. They keep my husbands heels off the bed to prevent sores. Great product! Arrived on time, good product. We used to use air-filled boots and they would always pop eventually. Tried some other non-air filled boots but they were too firm and started to cause pressure sores. These are perfect! Somewhat expensive, but it does the job.. Wound Dr. suggested this but it is so bulky that my husband would not wear it. He felt it forced his foot to fall to the side. Unfortunately, he will not use. it.